These General Purpos absorbent pads absorb both oil based fluids (petrol, diesel etc) and water based fluids. Every automotive shop, car care facility, or industrial area should keep a supply of TIDDOX's GENERAL PURPOSE ABSORBENT PADS on hand. These meltblown pads are specifically designed for use in settings in which large spills need to be rapidly absorbed and soaked up, whether they be from water based liquids or oil based liquids. As a general purpose absorbent pad, these products will not differentiate between water fluids or oil based fluids such as fuel, diesel, chemicals, solvents, and paints. The superior strength of each pad's heavy duty meltblown polypropylene material means that each pad can absorb up to one litre of fluids. As a low lint material, the pads are useful in environments where excess amounts of lint is not wanted. These absorbent pads do not function as towels or wipes. They measure 45cm x 45cm, and are designed to be just the right size to be placed under a vehicle or machine that is leaking. Put it beneath your workspace and it will absorb leaks and drips. The pad can be reused until it has reached its full capacity. You get 100 pads in each pack. That means your shop or workspace is protected from 100 liters of fluids. The grey color is not meant to be decorative or noticeable, simply basic for the job they do. They soak up gunk, and are to be safely disposed of when they are full. Mechanics in automotive shops use these AUTOMOTIVE GENERAL PURPOSE ABSORBENT PADS to soak up spills. The pads will contain and soak up fluids, whether they are oil-based or water-based. Have your mechanics place one under the wheels of a car when he is bleeding the brakes, and you won’t have brake fluid all over your shop floor. When you remove the heads from an engine, or the engine itself, place it on a couple of these pads to absorb the remnant oils and antifreeze that inevitably leak out. Not only will this decrease the amount of shop sweep you use, it will keep the shop floor safe to walk on. Car care companies and enthusiasts use the grey CAR CARE GENERAL PURPOSE ABSORBENT PADS to protect their garage floors and customers’ property. Enthusiasts who collect classic cars know that there is invariably a leak somewhere. Rather than an unsightly sheet of cardboard that simply funnels the leak to the side, these pads provide a tidy solution to the leak. They absorb all liquids, whether oil or water based. The assembly line and manufacturing spaces in your business can make good use of these INDUSTRIAL GENERAL PURPOSE ABSORBENT PADS. They are specifically designed to soak up floor spills and retain their structural integrity even when soaked with chemicals or solvents. 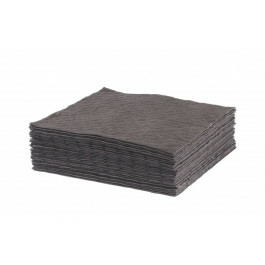 Keep your workspaces safer and cleaner with TIDDOX's GENERAL PURPOSE ABSORBENT PADS by ordering a pack of 100 grey pads, capable of holding up to 100 litres of any fluid or viscose material, and significantly reducing cleaning problems in your automotive garage, manufacturing floor, or car care facility with these absorbent pads.